Among Miura's many, many works, there is one (and only one) play script. It was written to be performed at Christmas to an audience of children. In January of 2010, I wrote a post titled The Tongue-Cut Sparrow, Revisited in which I introduced this play in detail. To make sense of this update, please read that post now, if you haven't yet done so. 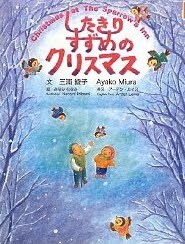 About twenty years ago, when we lived in Osaka, I translated the story into English and added illustrations so that my husband could use it in English classes and Christmas events at the college where he was teaching. More recently, I converted my translation back into simple Japanese, which I combined with my illustrations to turn it into a kamishibai (story board) for reading aloud to the children at our church here in Sapporo. I have just learned that Miura's play was published as a picture book in 2008! Click here to see the listing on Amazon Japan and here to see the listing on Amazon US. It appears to be a bilingual version with both English and Japanese text. The English title is Christmas at the Sparrow's Inn and the name of the translator is Arden Lewis. I am not familiar with the translator, and I haven't yet seen the actual book, but if you have, please post a comment below. If you could track down a copy, I'm sure it would make the most awesome Christmas gift for the children in your life, especially if they understand Japanese or English or both.